Protesters In Moscow Demand Explanation For Health Care Cuts Several thousand demonstrators marched on Sunday to protest the government's plan to eliminate jobs for up to 10,000 doctors and close 28 of Moscow's hospitals due to budget cuts. At least 5,000 Russians marched on a frosty Sunday afternoon in Moscow to protest plans to lay off thousands of doctors and close hospitals against the backdrop of a flagging economy. 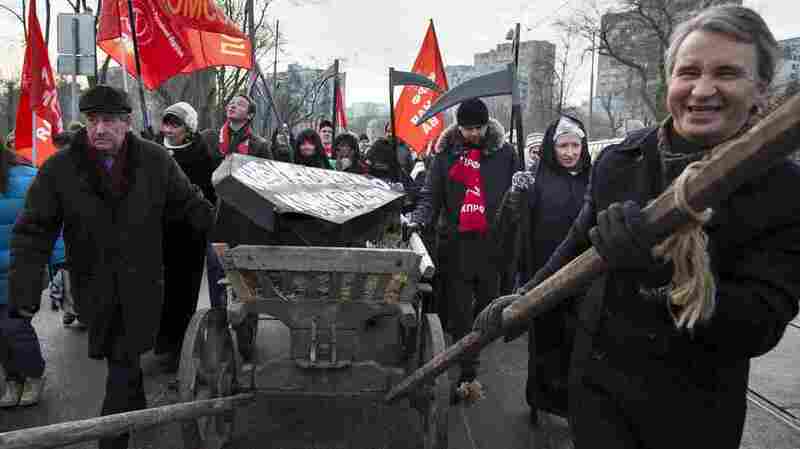 In the numbing cold, several thousand demonstrators marched in Moscow on Sunday, protesting plans to make drastic cuts in the city's health care system. It was the second protest in the past month over a pocketbook issue that affects most Russian consumers — especially as people feel the effects of a weakening economy. Protesters waved flags and carried banners with slogans like "Save money on war, not on doctors." It was a relatively small demonstration, but it drew broad support. And it signaled that while Russian President Vladimir Putin has been facing growing international isolation for his foreign policy, he's also under pressure at home. The demonstrators ranged from doctors and patients groups saying the medical system desperately needs reform to Communists who want to return to a Soviet-style system of free medical care. They all say the government's reform plan is a heavy-handed scheme concocted by government bureaucrats who never consulted the medical community. "They haven't explained anything to anybody," says Tatiana Korshunova, a blood technician on a heart-surgery team. "They haven't explained why they're cutting the number of hospitals or how they're going to do that. They haven't explained why they're cutting the number of doctors." The government's plan would eliminate jobs for up to 10,000 doctors and close 28 of Moscow's hospitals and clinics by early next year. Korshunova says it is humiliating that medical workers weren't consulted on something that impacts so many of them. The city administration says the closed hospitals will eventually be replaced by neighborhood outpatient clinics. Pavel, a 30-year-old cardiologist, says that's just doing things backwards. "We do need reforms, but not the way they're doing it," he says. "They need to build up the clinics before they close hospitals and lay people off." Pavel didn't want to give his last name because of fears of political repercussions for himself and his boss. Many people at the protest said the problem is not just with medical care, but with a government that has grown deaf to social needs while it boosts spending on the military. Russia is in a precarious financial situation, battered by low oil prices and Western sanctions. Putin has doubled military spending in the past decade, and the latest budget calls for still more increases over the next two years. The same budget will cut spending on health care, education and pensions. That doesn't go down well with protestor Ivan Nabrienko, who says there's a potential for a lot more people to get involved. "The health care is one of those special social domains that touch everyone," Nabrienko says. He says that's why he is at the protest — because he might one day be a patient in that health care system. If more Russians see the health care system as failing them, Putin's government could be facing a future of discontent.